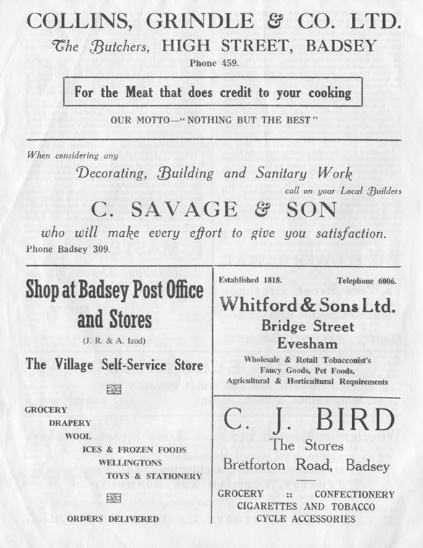 Everyone in Badsey receives the Community News, a local publication, which drops through their letterboxes every month. 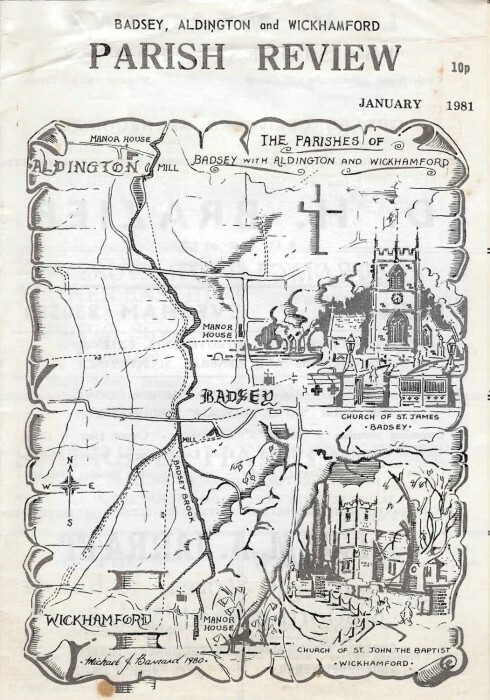 There has been a parish magazine in Badsey, in some form or other for over a hundred years, give or take a few years when it wasn’t printed. It has evolved from a mere ‘wrapper’, to the eight page illustrated magazine we know today. Throughout its history it has been church led. 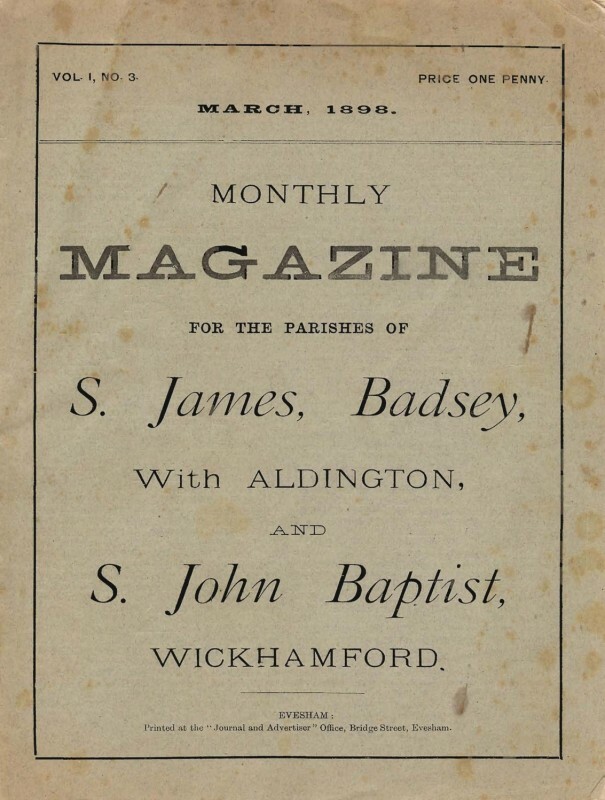 It was possibly the need to ‘educate and inform’ the common man in the beliefs of the church that led to the formation of the parish magazine. For inside this ‘sandwich’ of local news, sat a ‘meaty’ document defining the requirements needed to lead a good Christian life. Preferably as a churchgoer. The first magazine we know of was published in 1898. It was printed in Evesham and cost the sum of one penny. It was simple four page ‘wrapper’ or cover, for a ‘bought in’ monthly insert. The magazine was set up by the Rev. W. H. Price. He was a man of learning, he also had to be a man of means, as the magazine lost £2 in that first year. However, with the insertion of advertisements into the magazine the publication soon paid its way. 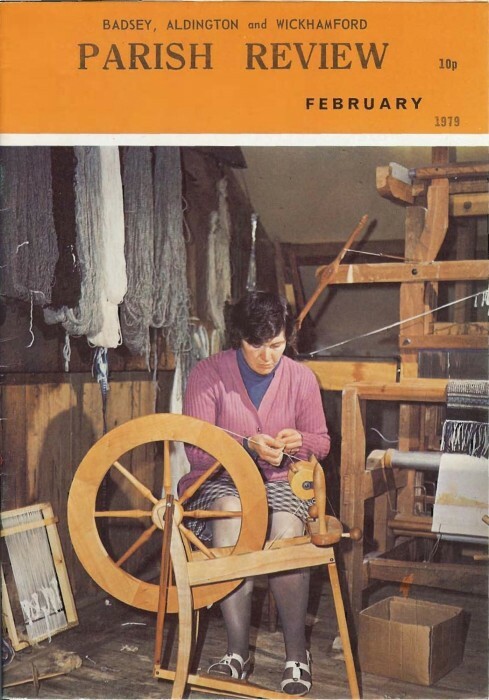 From the very beginning, and throughout its history, the content of the magazine has included church service times, dates and reports of local events, births, marriages. deaths, and obituaries. And one such obituary was written by another village stalwart, Charles Binyon, in 1903 for the Rev. Price, who collapsed in church whilst giving holy communion, and died later that day, aged just 42. The following month’s magazine contained a ‘separate’ photograph of the late vicar, but the extra cost involved meant the price of that particular magazine doubled to tuppence. We now skip fifty years and two World Wars to 1948. The magazine cover is now illustrated with a sketch by Mr. Binyon. And amongst its contents is a report of a talk on ’Austerity in Olden Days’ given by Mr. Binyon to the Women's Institute, who then met at the Bell Inn. What becomes apparent is that the ladies opinion was that the austerity of a 17th century Badsey was less austere than a 20th century Badsey. 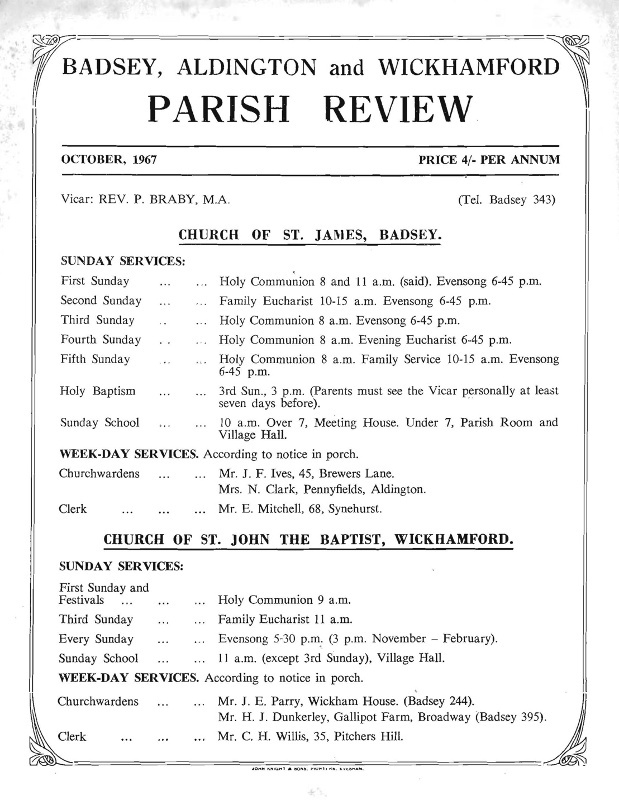 Although not in the Badsey Society archive, there would have been a parish magazine published in 1947, as details of it appear in a balance sheet shown in the January edition of 1948. The magazine editor was Maurice Harvey, the village school headmaster, who tells us that there was a profit of £5 6s 6d from the 3600 copies printed that year. 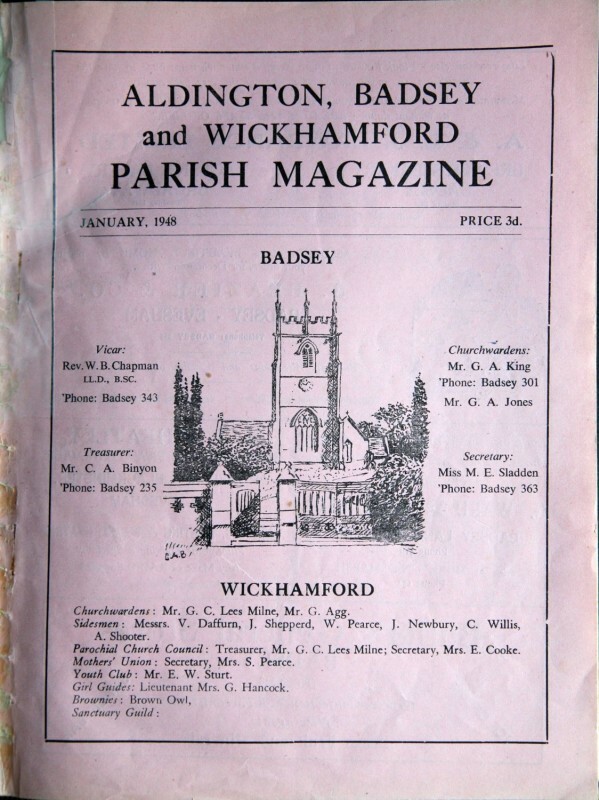 I keep referring to Badsey, but the magazine also included news for the hamlet of Aldington, as well as the neighbouring village of Wickhamford, which had its own section in the magazine. Vicars play a big part in the make-up of the magazine. From the first editions there has been the Vicar’s Letter. A chance to move from a font for baptising, to a different type of font, a font for chastising. Possible criticised for his choice of hymns, he challenged his congregation to do better. However, he then sets out a list of criteria that must be met in choosing the hymns so that they match the churches year, adding that he was once a ‘commoner’ himself and knows how difficult it will be for them. No doubt, the parishioners were pleased when in the April edition of 1969 the vicar states, “My dear People, Good news for you! This wordy man is once again deprived of space for a letter.” One of the reasons for the lack of space was due to the vast amount of adverts. Of the eight pages of the magazine four and a half pages were solid advertisements. 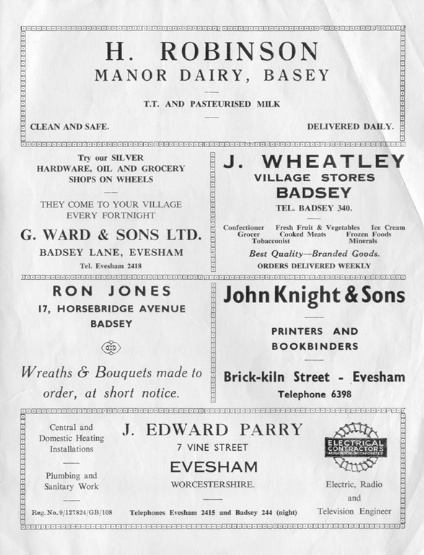 If we take a look at a few of these adverts we soon see what a ‘complete’ village Badsey was. There was a post office, two banks, three pubs, a butcher’s, as well as six grocery shops in the village at that time. One of the advertisements is for George Ward and Sons of Evesham, they owned a set of mobile shops. These silver coloured vans travelled round the Vale selling everything from soap powder to paraffin. One of their drivers was George Dallimore of Badsey. He had been sent out on a round on the other side of Pershore. George got lost, and having forgotten the name of the village he was looking for, asked a local. “Its something to do with ducks!” he said. He was actually looking for Drakes Broughton. In 1979 the vicar was Rev. Adrian Leak and the cost of the Parish Review was ten new pence. 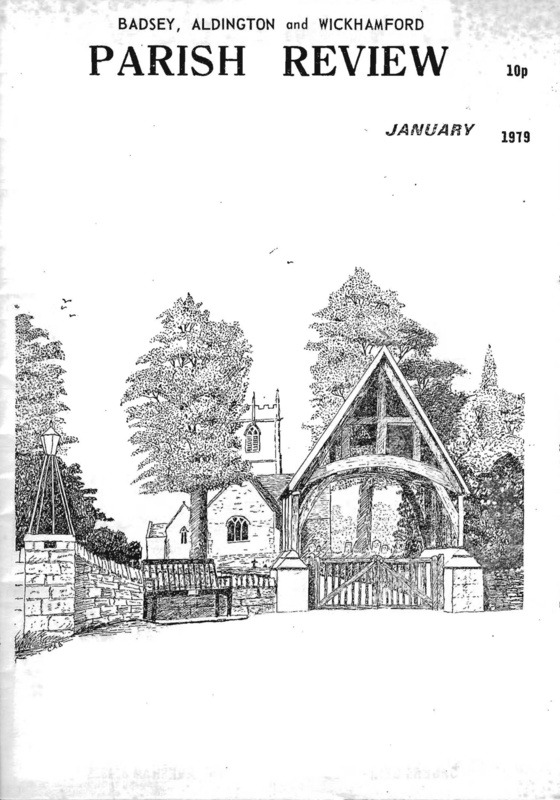 The cover illustration was another of Mr. Binyon’s drawings, this time of the lych-gate. What we are discovering is that these magazines give us an insight into the recent history of our villages. But they do throw up queries that they do not answer. One such query I found, referred to the lych-gate. The vicar had said that the lych-gate would be locked on the 1st August, all day. Why? I wondered. In these cases further research is required, or you can have a word with your local village historian, our’s being Terry Sparrow, who told me it was to do with public footpaths and rights of way. The magazine by now had changed its size, instead of being based on an A4 sheet of paper, it had halved to A5. A bright new colourful cover was introduced, however as its subject didn’t have any local connection it somewhat lost its appeal. It was still basically a ‘wrapper’ for an inserted national newsletter, which was now entitled ‘The Sign’. In 1981 the cover of the magazine was replaced with a sketch by local artist, Michael Barnard. and this featured on the Parish Review for the next fifteen years. In the mid-nineties the church entered a state of flux and no parish magazine produced. Changes to the benefices then moved Wickhamford away from Badsey, and into a group with Broadway, and so ended a long relationship with Badsey ecclesiastically. 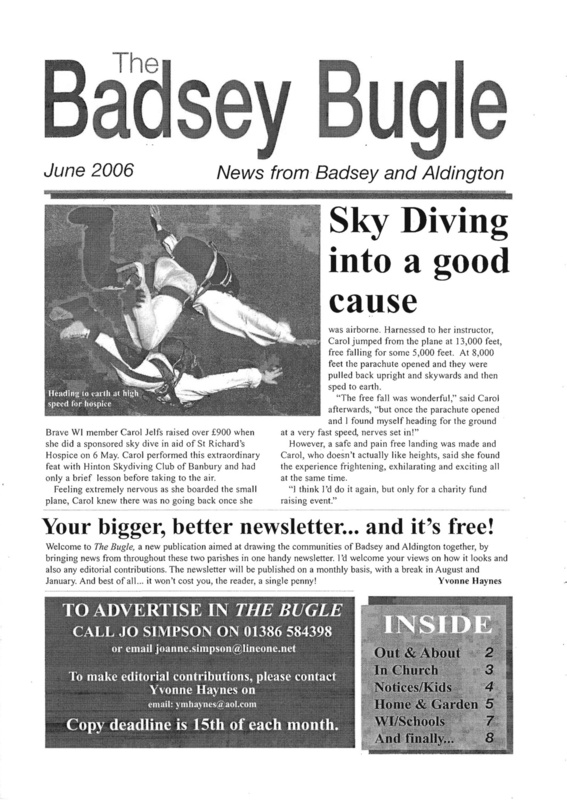 By 1998 Adrian Hough had become the vicar of Badsey with Aldington and a ‘free’ Parish Newsletter was now produced, but this photocopied A4 folded sheet was a poor reflection on what had gone before. 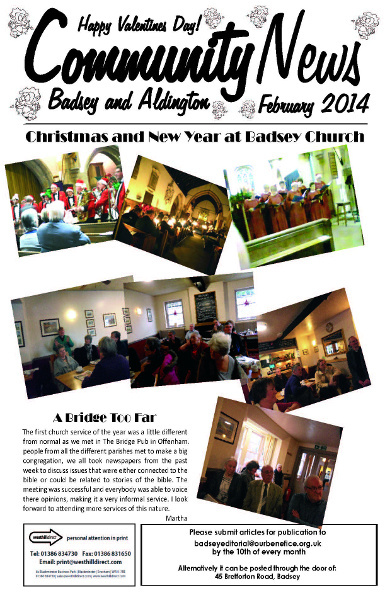 Into a new millennium, and by 2006 a new era of parish magazines was trumpeted in with the Badsey Bugle. This brainchild of Yvonne Haynes was an 8 page A4 size illustrated magazine with features, news and stories. It still retained its connection with the church, and the vicar’s letter still appeared. The first edition featured a recipe for asparagus twiglets, but within six months it had proved a recipe for disaster as the advertising revenue failed to cover the costs of production and that sounded the ‘Last Post’ for the Bugle. However, one step backward by our current incumbent, Richard Court, soon led to two steps forward. Returning temporary to the old A4 folded sheet format to produce an interim fill-gap solution meant that the village never lost its parish magazine. And within a few months an editorial team of Sheila Lancaster, Yvonne Haynes and Terry Sparrow would create the first edition of what we know today as the Community News. It has grown from four pages to eight, and current editor John Cole, has talked about adding another four pages to accommodate the many advertisers on the waiting list. Its future success depends on the help of the various organisations in the village supplying a constant stream of reports and stories. For who knows, a story written today will still be read in another hundred years. Since 1898 the parish magazine has been chronicling the lives of the people of our community, and as such is a great resource for researchers. The Badsey Society, has painstakingly digitised these publications and they are now available to all on the Society’s archive website.